Gently push the cup against the fetal head when applying suction to achieve a good vacuum over all areas of the cup. Increase the pressure to 0.2 kg/cm2, check for maternal tissue entrapment between the cup and the fetal head, then increase to 0.8 kg/cm2. Recheck for any maternal tissue entrapment prior to applying traction. 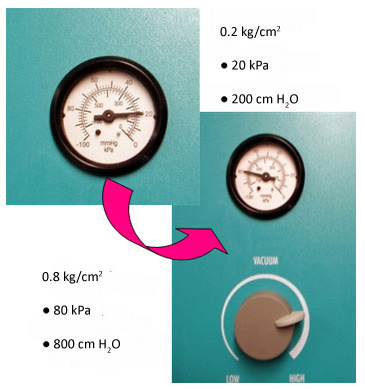 It is acceptable practice to increase the pressure directly to 0.8 kg/cm2 when using the silastic cup as long as you continuously check for maternal tissue entrapment whilst increasing the pressure.